Our farming philosophy is based on our acceptance of the fact that man will never be able to understand nature’s full complexity and interactions. We therefore choose to concentrate on observing and learning the movements of Mother Earth in her various energetic and cosmic passages and prefer to follow her indications as to what to do, instead of deciding and imposing ourselves. Consequently this has taken us to possibly avoiding all treatments on the land we cultivate, wether homeopathic, organic or biodynamic. Accepting and following nature is our guideline as the divine ability to understand the ‘Whole’ was obviously not given to man as we are only a part of this complex and not God himself. 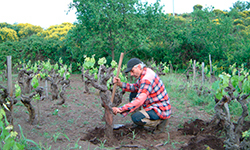 Our farm and vineyards are located in Sicily, in the Northern valley of the active volcano Etna. 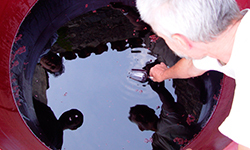 The northern valley is considered today Etna’s top area for single-vineyard (contrada) red wines like the “Côtes-de-Nuits” in Burgundy or Piemonte’s “Barolo” area. The surface area of our estate is approximately 24 hectares, of which 13ha are old vines in the classic free standing alberello training system (Gobelet or bush-vine), 9ha of old vines transformed into modern rows with various width, approximately 2ha of olive growth and the remainder are fruit trees, vegetables and bush. Although Etna has a tradition in high density plantation of vines, we search to reduce monoculture and have interplanted various local fruit varieties and keep bees to regain a complex ecosystem. The new vineyards are planted without grafts, using a selection of our original, ungrafted vines. The training system used is the alberello. Buckwheat is used for rebalancing soils low on organic material without recourse to industrial compost, especially important when preparing land for a new vineyard plantation. We avoid soil-tilling as much as possible, although this depends on the vintage and the quantity of water over the winter (recovering of the vines after the production cycle). Our goal is to avoid all treatments whatsoever in the vineyard, orchard and surroundings, in which we succeeded even in difficult vintages such as 2004 and 2005. Unfortunately there will always be the vintages where treatments with copper sulphate and sulphur are necessary to avoid vines from dying like 2013 and 2015. Our products are the result of this philosophy and our hands and team. Wines and olive oils which reflect ultimate territorial identity and mineral depth carry the name Magma® and MunJebel®. These are single contrada (cru) and vintage wines and olive oils from various superb terroirs between 600-1.000 metres altitude. 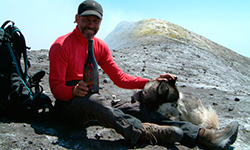 Magma® Rosso is our “Grand Vin”, produced from only Nerello Mascalese grapes in contrada Barbabecchi. Magma® Olio di Oliva is pressed from perfectly ripe San Benedetto olives from contrada Borriglione. 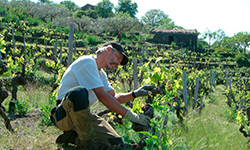 In order to obtain profound, territorial wines, our grape yields are low, around 300 to 600g per vine for the top vineyards and wines, achieved by pruning very short in the dormant season. On our Grand Vin Magma®, every grape cluster is tailored, with tails cut away and unripe or damaged berries delicately hand picked out. We harvest relatively late, in search for perfect phenolic ripeness, starting mid October to early November, effected in multiple passages, to obtain dense and profound wines. The grapes are transformed in a delicate way, fermented with the skins in small neutral tubs to avoid high temperatures during fermentation, which lasts at least until alcoholic fermentation is finished, depending on the quality of the skins, enabling the fermentation to finish perfectly. After this stage, the wines are gently pressed and stored in neutral vessels in order not to absorb any external flavors. 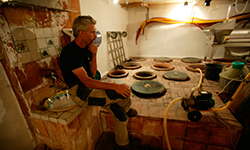 The wines destined for early bottling go into larger epoxy decanting tanks whereas the wines destined for longer aging due to higher tannin levels and/or structure age in smaller epoxy tanks of max 2.500 litres, or epoxy coated terracotta vessels buried up to the neck in the cellar in ground volcanic rock. Olive oil has become a real passion. The idea of making a no-compromise olive oil has taken us back to basics, employing the same philosophy and quality standards and selections of our Grand Vin, Magma®. Starting with the delicate and elegant San Benedetto cultivar which gives the highest territorial definition and most delicate aromas, selecting terroirs that have the capacity of high definition, hand picking in multiple passes only the ripe ones, then deselecting olive by olive(!) to keep just the perfectly healthy/undamaged. These are taken to the press house in small cases of 5kg, in order to avoid damage. Gentile crushing avoiding oxidizing is applied to maintain the molecular integrity of the olive paste before separating the liquid from the solid part. The oil is then decanted into glass demi-johns for resting under inert argon gas, before being bottled unfiltered. Obviously, this oil also carries the name Magma® reflecting its heritage and minerality. As bread is a daily need and the origin of the most nutritious cereals are in Sicily, we were drawn to produce this obvious and classic farming product, abandoned many years ago in our region. Although our farm horse Asturia died years ago and this project is postponed until we have the time and proper space to work cereals, we continue to grow buckwheat on land which is being prepared for planting vineyards, as buckwheat helps regenerate soil. Our ultimate goal is to evolve towards a self-sustainable agricultural reality based on the trilogy of Mediteranean farming (cereals, olive oil and wine) without exploiting Mother Earth, to produce whilst also returning, evolving towards an equilibrium of the land, which will take a lot of time before achieving. Making such products without compromise in quality and profoundly authentic to territory, with low yield, high attention to detail, and continuous investing in quality with respect for nature adds up to a certain cost. Our Grand Vin Magma® and our MunJebel® single vineyard crus are wines with an inevitably high price tag and therefore we take pride in producing and offering at a great value for money our classic MunJebel® Bianco and Rosso estate wines and especially our entry level red Susucaru® rosso and Susucaru® rosato. These wines are great value, produced from local red and white old vine varietals from different contradas. Although less defined than our MunJebel® crus or Magma®, these wines express the same estate philosophy in the glass. All our products contain very small quantities of preservatives which requires storage below 16°C.